Katherine is a business communications specialist who has participated in numerous presentation skills workshops, trade shows, live industrials, interactive training sessions, and secret shopping missions. She frequently collaborates with innovative and effective training organizations and messaging specialists, including Workplace Interactors, Live Marketing, The Breakthrough Group, and Mondo Learning Solutions. She works as a trainer, teaching leadership, sales techniques, and effective communication, and as a brand ambassador, working with sales and marketing teams to deliver key messaging at sales meetings and trade shows. 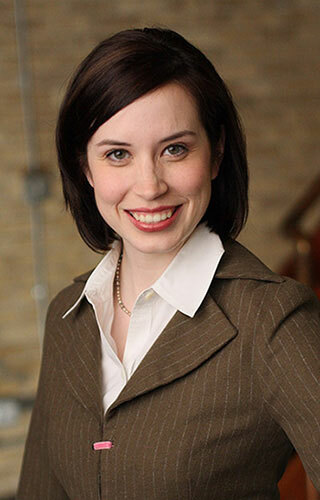 In the legal field, Katherine has served as an actor-improvisor for deposition and trial training at Kirkland & Ellis LLP’s training institute on multiple occasions. In the medical field, she has worked as a standardized patient for the Masters in Nursing program at the University of Illinois at Chicago. Katherine is also a private speech coach. Further information regarding Katherine's business communications experience and qualifications is included in her corporate resume (PDF format). If you are interested in working with Katherine, please email her directly or contact one of her partner organizations below. Workplace Interactors are specialists in creating practice for workplace learning, believing the best practice involves real people in real time. Learning topics include sales management, coaching, communication, conflict resolution, and change management. In Katherine’s work as an interactor, she participates in scripted and improvised workplace vignettes designed to emphasize a variety of workplace learning skills. In this capacity, she has worked with WE Energies, Johnson Controls, Hollister Medical, Quebecor, Northwestern University, and Rosalind Franklin University, among other clients. Live Marketing is an award-winning marketing agency that specializes in bringing an organization's brands and messages to life. Specifically, Live Marketing increases companies' success in communicating their stories live and online, using experiential marketing, technology, and digital and social marketing. Katherine’s work as a professional engager includes delivering high-level talking points to trade show attendees and engaging them with qualifying questions to enable increased lead captures. In this capacity, she has worked with multiple flagship companies.